This exquisite jewel-like fluted dish and lidded vase was designed to hold perfume. The beauty of its form provides testament to the high regard with which perfume was held in the Mughal court. The dish sits on a high, flared ring foot. 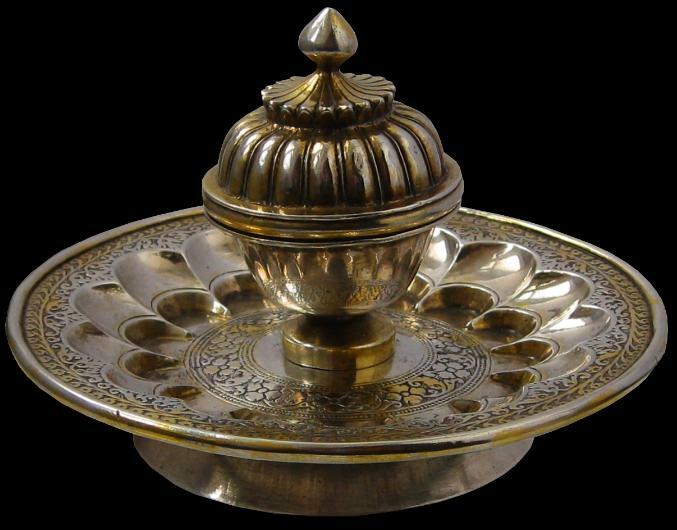 It has a lipped rim, double-fluted sides reminiscent of Mughal dinner plates of the same era, and is chased around the rim and in the base with floral borders. It has been fashioned from heavy-guage sheet silver. 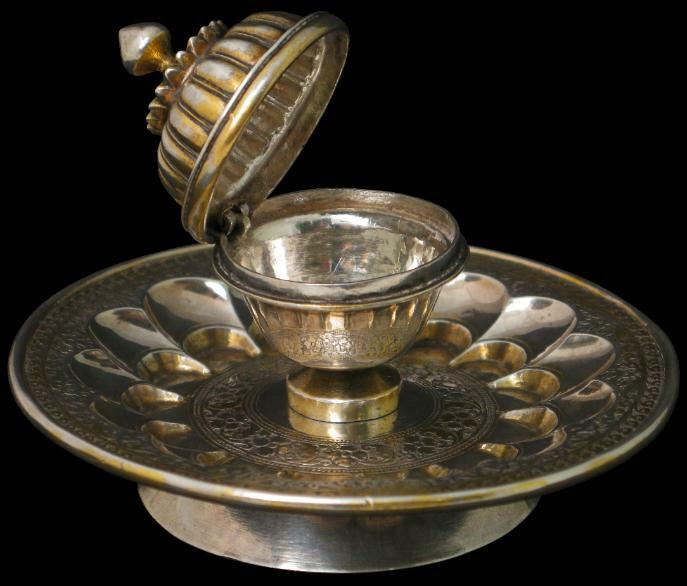 The perfume container attaches to the dish by means of a bayonet fitting. Of elegant goblet form, it rises from the dish and has a hinged, domed and ribbed lid that terminates with a bud-like finial. 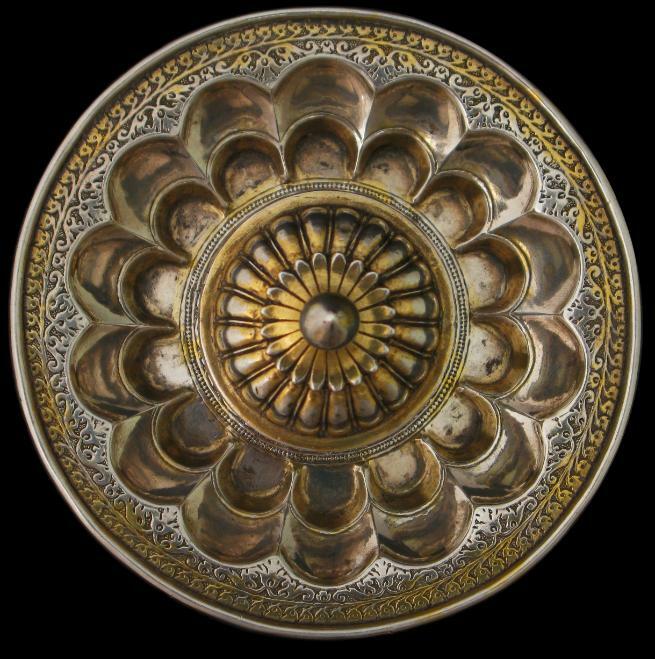 The lid and outer border of the dish are in parcel gilt. Overall, this is a rare and elegant item – an extraordinary link to the courts of the Mughals. The condition is excellent – is free of any dents or repairs. Three examples of similar form are illustrated in Terlinden, C., Mughal Silver Magnificence, Antalga, 1987, p. 88-89. 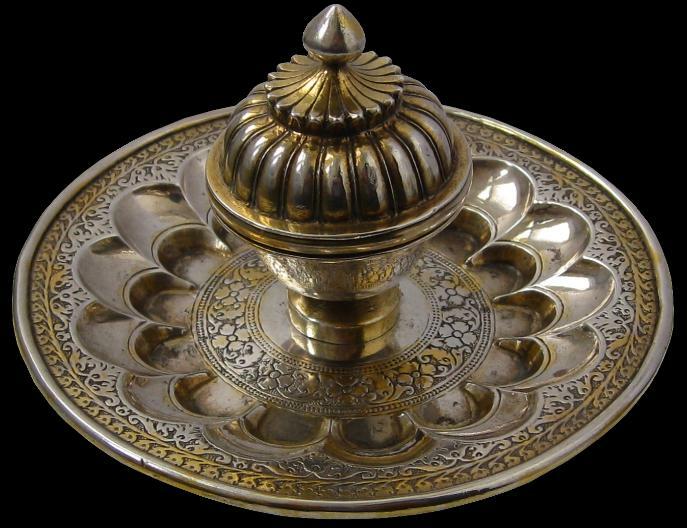 A similar example is illustrated in the catalogue ‘Reflecting Power: Three Schools of Indian Silver’, Curator: Wynyard RT Wilkinson, Indar Pasricha Fine Arts, London, July 2008.